Messier 81 is a fairly bright galaxy in the constellation Ursa Major. It is a spiral galaxy with a lot of new star formation occurring everywhere from the core out to the faintest arms. The spiral arms get their bluish color from all of the young hot stars created as recently as a few million years ago. Some star formation was accelerated by interactions with neighboring galaxies M82 and NGC3077. The spiral arms also contain older stars formed from these past gravitational interactions about 600 million years ago. The arms also contain a lot of spiraling dust lanes starting from the outer arms and ending in the core area. The core area is much larger than our Milky Way core and is reddish in color due to the older age of the stars in this region. A large black hole about 70 solar masses in size is 15 times larger than the black hole of our galaxy. It is this large black hole that is creating the massive bulge at the core. M81 is also a member of a galaxy group named the M81 Group. There are 34 galaxies in this group but one of the most prominent members is M82, the Cigar galaxy. M81 and M82 are often photographed together because they are each very interesting galaxies and can be captured with short focal length telescopes. 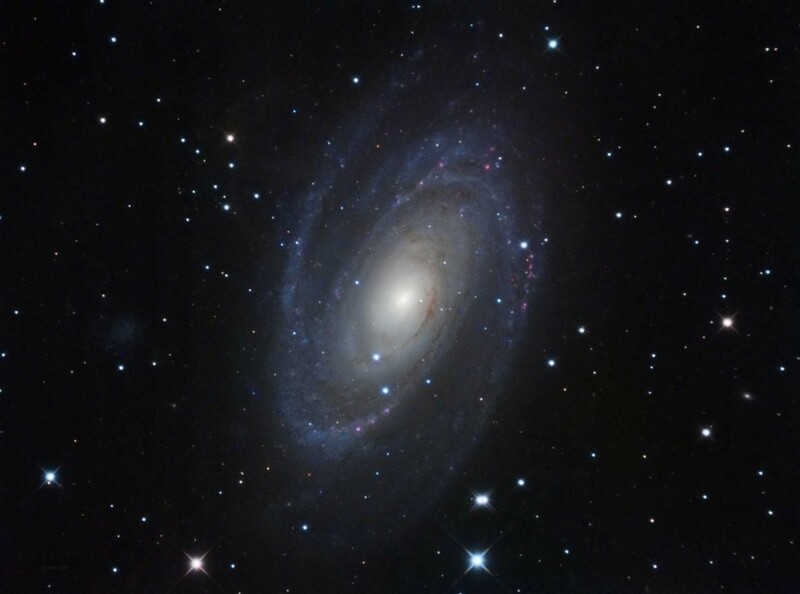 What draws a lot of attention is M81 being a large, bright, colorful galaxy and M82 for being smaller but also bright with colorful starburst features. Additionally, they are very close to each other and as mentioned above they have interacted before with stunning results. The next prominent member is NGC 2403 which is a spiral galaxy and also quite large at 50,000 light years in diameter. The other group members are not so well known and are quite dim. This image was captured from my house in a Bortle 6 region. The humidity was between 70-90% with a slight breeze. I managed to capture this in one night which was unusual for this time of year as the marine layer usually rolls in by 11 PM.